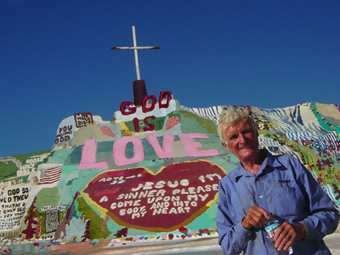 Imagine if you will, 60’s pop artist Peter Max throwing up a mountain load of the Lord’s word in the middle of the Southern California desert, and you’ll have an idea of what Leonard Knight’s Salvation Mountain looks like. Over three stories tall, and spanning more than 100 feet (and expanding daily) this man-made Technicolor homage to the Old and New Testaments is an impressive sight regardless of your religious beliefs. white hair covers his scalp. His skin has been weathered and tanned from years of “living under the stars” in this otherwise barren wilderness, and Leonard possesses a peaceful smile that suggests he honestly believes he has spoken to God, and vice versa. In 1971, handyman Leonard saw a hot air balloon fly over his Vermont home. It didn’t say God is Love on it, but he wished it did. Years later in Nebraska, Leonard built his own balloon with that message emblazoned upon it. The balloon never actually ascended to the heavens, and eventually it rotted out, but Leonard remained undaunted in having his simple statement of love noticed. 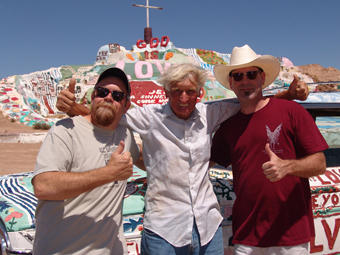 Finally in 1984 Leonard Knight made his pilgrimage to Niland, California. Traveling about 3 miles off Main Street in this arid, small town that previously had little else to offer visually other than trailer homes and power lines, he began his Noah-esque project, cubit by cubit if you will, and has been working on it daily ever since. The people of Niland have taken to Leonard. He is more than welcome to sit for hours in the little restaurant up the street when the heat gets too much for him. He has been the King of the Tomato Festival Parade, and even art historians talk about his work. At one point there was talk of demolishing the mountain. The government claimed Mr. Knight was a squatter, and that the paint was lead based, and thereby toxic. While it seems Uncle Sam was correct on both counts, Leonard is still here, and his mountain is in no danger of going anywhere either. It also says so on Salvation Mountain. Constructed of adobe, Leonard Knight guesses there must be 1000 bales of hay, tons of mud, and peppered in for good measure are the occasional sticks and car tires. The paint that covers the giant mound is over 4 inches thick in some parts. The mountain itself comes up like a multihued mirage out of the dry desert dirt. Flowers and waterfalls, American flags and hearts are artistically married to passages of the bible and simple messages of “joy” “peace” and “goodness.” It would seem near impossible to suppress the childlike urge to climb to the top of the mountain the minute you see it, and Leonard is more than happy to have visitors enjoy the mountain even if they only see it as a piece of art. Leonard lives in his truck year round in a town where temperatures can soar as high as 120 degrees in the summer months. His home is a beat up 1940’s cab, with a wooden shack reminiscent of the Little Rascals clubhouse built atop. Naturally the truck, as well as every other car and bus that Leonard owns, is also painted to match the mountain. About the only thing that isn’t painted on this government owned property that Leonard took over years ago is his dog, Boy. “I suppose I’ll leave him just as God created him,” chuckled Leonard.